The Walt Disney Animation Studios film for 2018 is Ralph Breaks the Internet, which is the sequel to 2012’s Wreck-It Ralph. Over the past two years, I’ve been fortunate enough to work on a number of improvements to Disney’s Hyperion Renderer for Ralph Breaks the Internet; collectively, these improvements make up perhaps the biggest jump in rendering capabilities that Hyperion has seen since the original deployment of Hyperion on Big Hero 6. I got my third Disney Animation credit on Ralph Breaks the Internet! Over the past two years, the Hyperion team has publicly presented a number of major development efforts and research advancements. Many of these advancements were put into experimental use on Olaf’s Frozen Adventure last year, but Ralph Breaks the Internet is the first time we’ve put all of these new capabilities and features into full-scale production together. I was fortunate enough to be fairly deeply involved in several of these efforts (specifically, traversal improvements and volume rendering). As usual, I’ll update this post at a later date with more details, once more information is publicly shared at SIGGRAPH and other venues. One of my favorite things about working at Disney Animation is how production and technology partner together to make our films; we truly would not have been able to pull off any of Hyperion’s new advancements without production’s constant support and willingness to try new things in the name of advancing the artistry of our films. The original Wreck-It Ralph is one of my favorite modern Disney movies, and I think Ralph Breaks the Internet more than lives up to the original. The film is smart and hilarious while maintaining the depth that made the first Wreck-It Ralph so good. Ralph and Vanellope are just as lovable as before and grow further as characters, and all of the new characters are really awesome (Shank and Yesss and the film’s take on the Disney princesses are particular favorites of mine). More importantly for a rendering blog though, the film is also just gorgeous to look at. With every film, the whole studio takes pride in pushing the envelope even further in terms of artistry, craftsmanship, and sheer visual beauty. The number of environments and settings in Ralph Breaks the Internet is enormous and highly varied; the internet is depicted as a massive city that pushed the limits on how much visual complexity we can render (and from our previous three feature films, we can already render an unbelievable amount! ), old locations from the first wreck-It Ralph are revisited with exponentially more visual detail and richness than before, and there’s even a full on musical number with theatrical lighting somewhere in there! Below are some stills from the movie, in no particular order, 100% rendered using Hyperion. As usual, these are all from marketing shots and trailers; once the film is out on home media, I’ll add some more stills and such. Until then, if you want to see more, or if you just want to see a really great movie, go see Ralph Breaks the Internet on the biggest screen near you! There are a TON of easter eggs in the film to look out for, and I highly recommend sticking around after the credits. Here is the part of the credits with Disney Animation’s rendering team! This frame is kindly provided by Disney. 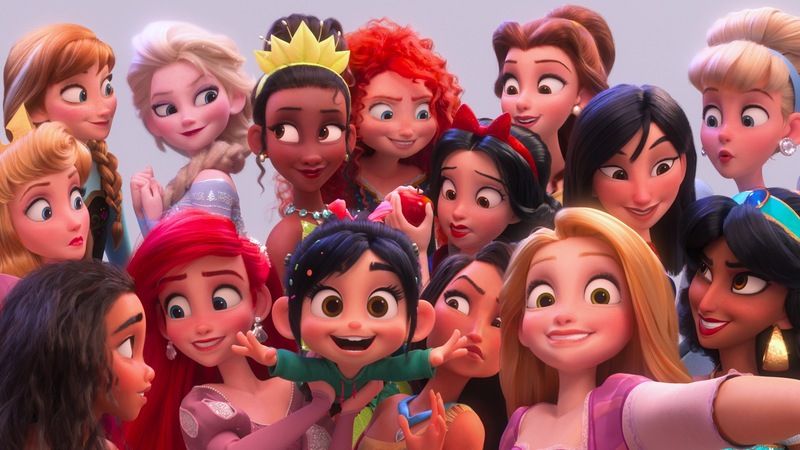 Every person you see in the credits worked really hard to make Ralph Breaks the Internet an amazing film! All images in this post are courtesy of and the property of Walt Disney Animation Studios.